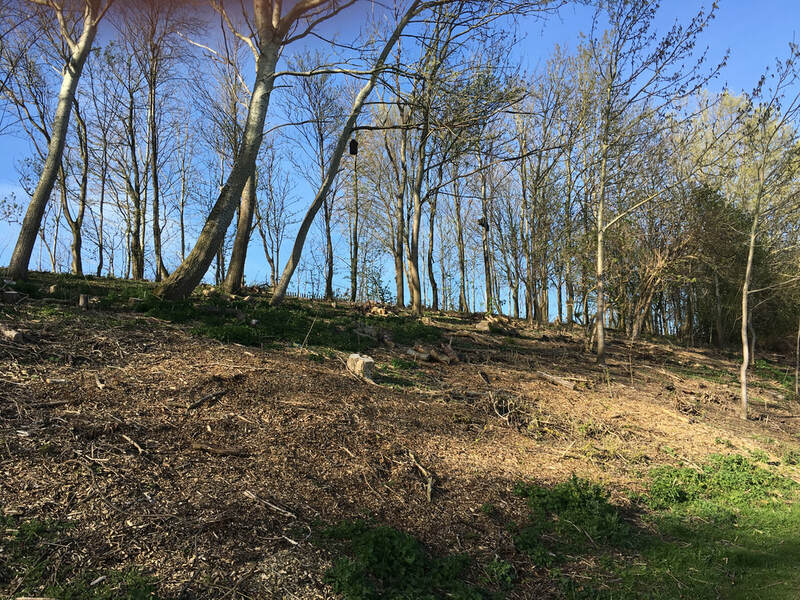 Although not particularly easy to see from the photograph over 100 whips (ie small whip-like trees) have been planted within the cleared area. They are all native trees and include a small number of oaks, possibly a beech and some rowan. Eventually they will create a good habitat and have certainly added diversity to the area. However, they are very small and it will take some years before their benefit is fully seen. The following letter has appeared in the Liverpool Echo, one of the Widnes papers and a shorter version of it was sent to Halton Borough Council. Mr Slater is a well-informed local ecologist. Early in 2018, I was surprised to note that a section of the woodland belt, on the embankment alongside the riverside walkway, at Pickerings Pasture, had been largely cleared of trees and shrubs. I was very surprised at this, as I could see that the work was not well-managed, sensitive thinning out or coppicing, but almost wholesale clearance. Fortunately, only a small section of the woodland was vandalised in this way, and I assumed that Halton Borough Council had seen sense, and called a halt to the work. However, this work has unfortunately recommenced this winter. Again, a large number of trees have been felled, and numerous shrubs removed. Some parts of the embankment have almost been completely cleared of vegetation. This has destroyed what was a very well-structured stretch of wildlife habitat that supported numerous species of nesting bird. Given that Pickerings Pasture is supposed to be a Local Nature Reserve, the rationale behind this work is baffling. Quite what wildlife this work is supposed to be supporting remains unclear. The whole purpose of a Local Nature Reserve should be to provide wildlife habitat and, if necessary, manage this for wildlife. What has taken place at Pickerings Pasture recently has destroyed the structure of the habitat (that has taken decades to establish) and in the process removed breeding sites, feeding, hibernating and roosting sites of a range of wildlife. A wildlife corridor has been fragmented, and made less hospitable to wildlife. One wonders who has sanctioned this work, and why. Given that local authorities are constantly claiming that they are hard pressed for funding (whilst crying foul about Government cuts), one wonders how Halton Council can justify the money spent upon this environmental vandalism. This damage has no clear benefits for wildlife, or visitors to Pickerings Pasture. Mr Slater, I am emailing in regard to a question that you have raised regarding works carried out by HBC operatives on the walkway at Pickerings Pasture. The work that has been undertaken is part of an overall Management Plan that gives the prescription to manage the site to the best of its potential and in keeping with our aims for the site, the Coppice Management of these areas will promote Biodiversity and is a recognised methodology to promote both Age and Species diversity of the shrub and tree layers and thus encourage more invertebrate activity and to provide ecological niches for the various passerine bird species on site. Although we are aware that it can look excessive, without this carefully planned and co-ordinated management regime we could in fact loose species and opportunities for new colonisation. As you state in your enquiry the sites status and designation means that we highly value the resource for the public and manage it to the best of our knowledge and in line with current ecological practice. Thank you for your reply. I fail to agree with your assertion that the work will benefit biodiversity. The work is excessive, and is close to wholesale felling. What was a well structured developing woodland (with an extensive shrub layer) wildlife corridor has almost been completely cleared. Structure has been removed and lost. I would be grateful if you could inform me what the target species are for this work. I am aware of all the species of bird that will have lost nesting sites due to this drastic work (along with feeding sites, cover and roosting sites), and the increased disturbance that will now inevitably occur to the opened up area, thereby discouraging species and increasing the likelihood of any birds trying to nest along here to suffer an an increased risk of nest predation. From your comments, we know many of you are upset by the work undertaken by Halton Borough Council and thought it interesting that two people, with similar qualifications, should have such differing views on the situation. Certainly, The Friends of Pickerings Pasture were given assurances early on that the work would be carried out in small batches over several years together with more variety of shrubs being planted, and we hope that this will still happen, giving the wildlife in that area some chance. We have no influence on Halton's management regime and agree that some work: coppicing and thinning of trees, is needed to improve the area. If you have any further thoughts, please add them to our COMMENTS PAGE.